Lately, it feels like a lot of my layouts have been more on the boy side. Since Reese is the youngest, I think I am taking more photos of him, because he is still going through all of the funny little firsts stages. But today, all of my layouts are about the girls...and I'll have even more girly layouts to share this weekend! These next two layouts use two of my fav collections from another manufacturer...yes, I have many favorites! :) Simple Stories has always really impressed me with the design and quality of their papers. 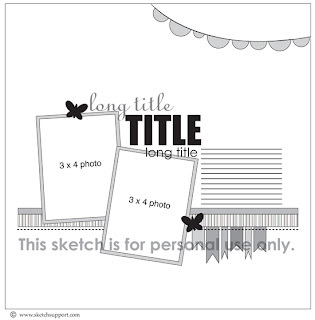 They are so easy to use and make for cranking out some cute and fast pages. I used their brand new Summer Fresh line on this first layout. I actually sent a message to my LSS, the day Simple Stories debuted this line on their Blog and said, "I MUST HAVE IT...Please order me a collection pack!!". Well, I picked it up yesterday and broke it open the minute I got home! Now, even though these photos are not necessarily "Summer" photos, I still thought they were perfect for this line because of the navy's and yellow's. This was our second trip to Build-A-Bear in a two month period...once for the girls' birthday in March and this trip, for my daughter's end of the year party with her Girl Scout Troop. They got to put together the cutest little Daisy bears, complete with matching GS vests!! I did this layout for one of my FAVORITE challenges at Club CK...the weekly issue challenge hosted by Erika Hayes. Our challenge this week, was to use Flags...one of the fun trends you see popping up everywhere. I decided to use some of the SS patterned paper and toothpicks to make some quick, and easy flags for my page. And for this last layout, I pulled off two challenges!! Club CK periodically hosts a 1 Hour challenge. Yesterday afternoon, they posted the Live challenge, which was to use buttons and/or brads to fill negative space. I didn't have a chance to participate during the Live challenge, but finished this one later last night. This is also my fourth layout completed for the Three Cool Chicks workshop, using Twine. I thought the twine through the buttons would be a great girly touch for this page and I added a piece of twine around the perimeter of each of the circles. I have to admit how much of a bad mom I am, and say that this is the first year that I have taken photos of the kids with their Easter baskets!! :) Easter morning is always like a whirlwind, because it is the one Sunday of the year, that we all attempt to make it to the early service at church. Most of the time we are still asleep at this time of morning, because we like attending the 10:45AM services. So, needless to say, trying to get the kids up and ready is close to a nightmare. But we did it this year...and actually got some scrap worthy photos!! Well, I hope you enjoyed stopping by today!! Tomorrow, I will be sharing a layout for our new Fabulous Friday challenge at Frosted Designs and my last layout as a Special Investigator at CSI for the month of May goes Live. I think this one ended up being my favorite of the month! :) And I will also have my last layout for our product exchange with Nikki Sivils on the Sketch Support Blog. So I hope you will stop back by and check it all out!! loving all your girly layouts, my fave being the first one, you did a great job with the dear lizzy line, my very fave cha release! the second one has lots of great details and that third one the photo with the sunglasses is just sooo cute! you've been busy, and they all look amazing as always! You do the cutest girl layouts Ashley. The are all so adorable. Your photos just tell the whole story. You showcase them so well. I'm in love with the strawberries in the jar! Way too cute! oh my goodness your LO's are awesome and inspiring!!! You should enter one of your girlie ones in the Getting Scrappy Challenge! Beautiful work and thank you for sharing! You are rockin' girl!! These are all GORGEOUS!! I always love love love your attention to detail you bring to each of your lo's!!! Just BEAUTIFUL!!!! I love these so much, Ashley! You continue to wow me with each of your layouts...such fun details! I'm working on a few pages right now using that Simple Stories line...you totally rocked it!